Standard & Poors released its May 2011 Case-Shiller Index this week. The index measures change in home prices from month-to-month, and year-to-year, in select U.S. cities. 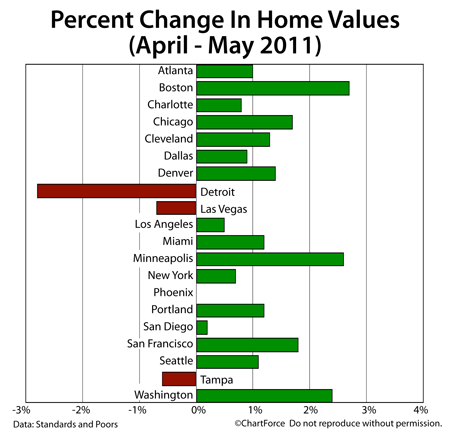 May’s Case-Shiller Index showed a 1 percent increase from April 2011. Home values rose in 16 of the Case-Shiller Index’s 20 tracked markets. Only Detroit, Las Vegas and Tampa fell. Phoenix was flat. Don’t look too far into the findings, though. Like the FHFA’s Home Price Index, the Case-Shiller Index is rife with flaws. The first flaw of the Case-Shiller Index is its limited geography. Despite being positioned as a national housing index, Case-Schiller Index is sourced from just 20 cities nationwide. There are more than 3,100 municipalities nationwide. The Case Shiller Index’s second flaw is that it ignores all home types excepts for single-family, detached homes in its findings. Condominiums, multi-family homes, and new construction are not included in the Case-Shiller Index. In some markets, these excluded home types outnumber the included ones. Furthermore, the Case-Shiller Index is flawed in that it takes 60 days to release. The Case-Schiller Index reports on a housing market from 2 months ago — hardly helpful for today’s buyers and sellers in Franklin , trying to make sense of today’s real estate market data. When you want real-time housing market data, therefore, for Hendersonville or anywhere else, look past the Case-Shiller Index and talk to a real estate professional instead. It’s where you’ll get your best, most relevant information.